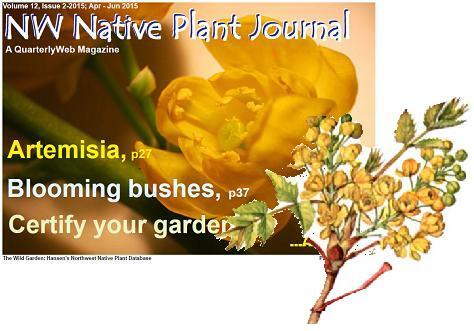 Our Journal can be viewed right from the web, you can download it to your computer or you can print a copy and enjoy it in the comfort of your easy chair or on your coffee break. 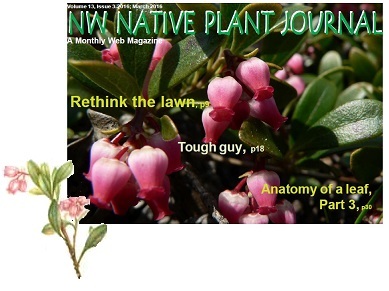 You'll find fresh articles about Northwest Native plants, tips for propagation, things to do in your garden right now, and surprises every issue. This may become your favorite gardening resource. How about making a special binder for your printed copies? Something good to read and very handy for future reference. 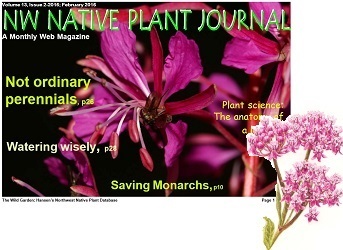 We've published this Journal in "pdf" form and you'll need the free Adobe Acrobat Reader to view, save or print it. Click on this link to get this handy program: Get Adobe Reader. We chose the Reader style because it makes viewing quick, it's easy to use, and thanks to Adobe it's entirely free. 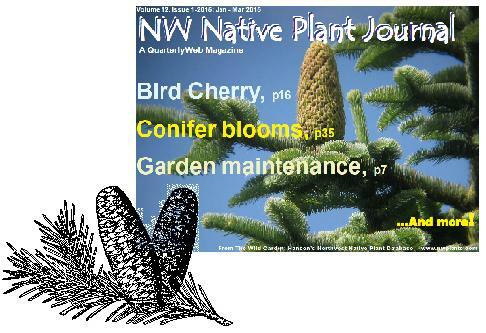 At right is our latest issue. Please to enjoy. An old idea ready for a makeover? 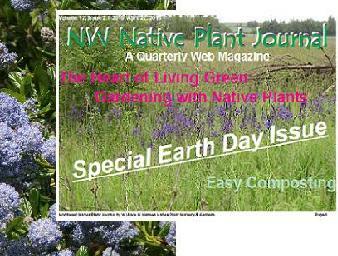 Special Earth Day Issue: It's all about this day! Extinction: New film, teens searching for extinct Labrador Duck. 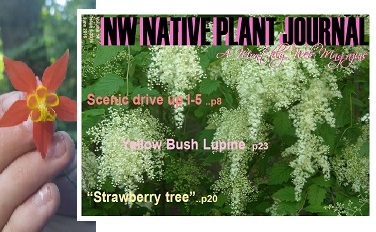 Dogwoods: Native trees, shrubs, perennials to fit any yard. Water: Nature's nectar--gotta have it. Rob Sandelin: Viewing the wilderness with another's eyes. Theme gardens: Now there’s an idea! Lilies: Summer blooms are not just a tropical treat! Garden design: Meet the pros--does your yard need a redo (or even a ‘do’)? 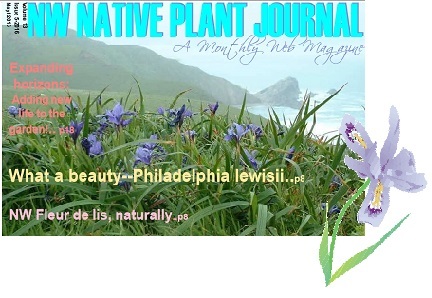 Native plants: Updated list, discover! WWID: What would Indians do? Winter: Native landscape beauty and interest, naturally! Extinction: And then there were none--when a species is gone for good. 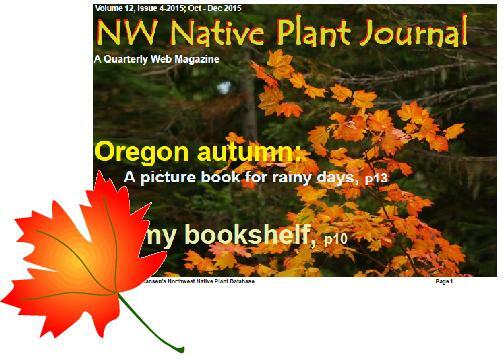 Living streamside: Using plants native to the Pacific northwest near creeks and streams. Free tree programs! Leaves of autumn: Fresh photos! Bay City rain garden: Not just for experts, Tillamook County leads the way with example to follow. Beautiful northwest evergreen: Modoc Cypress. A summer destination: Visit Seattle’s Burke Museum by Jennifer. 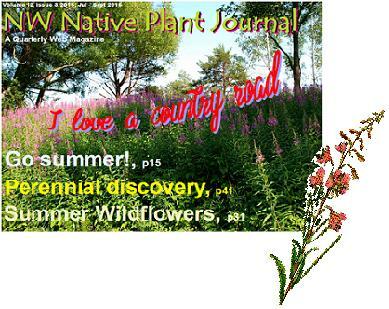 Growing wild strawberries: Groundcover plus food! Monthly highlights: Look forward to these! The other 3 R’s: It’s not "readin’, writin’ & ‘rithmetic"
A different way to recycle: Using found treasures! Native choices: Why pick natives? Squirrel quiz: Test your knowledge! To lawn or not: Grass or groundcovers? Rubber mulch: Earth friend or foe? Toads in your garden: Seen any lately? How green are you? : Take a quiz and find out! 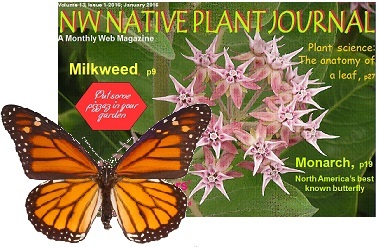 Shaping nature: Native plants never dreamed they’d look like this! Living fences: No paint needed! 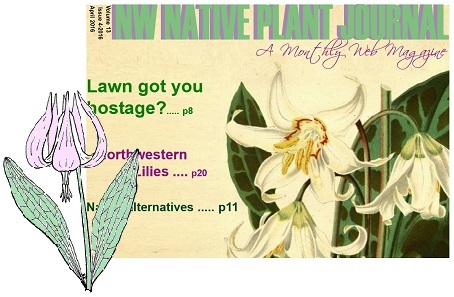 Local homes with native plants: Models for a makeover! Grow your own plants: And eat them too! Transformation of a garden: A new plan, the best one yet? Summer vacation ideas: What to do this summer? Find an adventure every day! Lacy white flowers: Good, Bad or Deadly?